Let’s be 100 per cent honest about today’s performance – it was awful – simply awful. This is no time to mince words – the manager got it horribly wrong in key areas. He started without Mark Noble, stuck the season’s most effective playmaker within the diamond – Stewart Downing – on the left and decided to play Joey O’Brien for the injured Carl Jenkinson. There was no room for Chiek Kouyate who we were told almost on kick off had come back from the African Nations Cup injured although there had been no mention of this earlier in the week and Diafra Sakho was nowhere to be seen with no explanation as to why. And after a lively first first 10 minutes it became crystal clear that the game plan was to defend deep and come away from Anfield with a draw if possible. Sound familiar? At no time did we trouble the scousers, Andy Carroll went off injured along with James Collins and Winston Reid. We finished with O’Brien in the middle of defence, Demel down the right and Cole playing one up – Sound horribly familiar? There was more bad news for Reid too before his departure because he was made to look a mug by first goalscorer Raheem Sterling (51 mins) on several occasions showing just why he will never be a top four player. Not good enough! Daniel Sturridge appeared for the first time in many moons to collect the second and you just knew it would be against us – a near post thump after 80 mins with which Adrian had no chance. Liverpool were better in every area of the pitch but we were never helped by the selection, tactics and general approach of a manager who to put it in the words of a famous song is beginning to look like a rebel without a clue! With players hobbling off through injury these are worrying times as we start to descend towards our usual level – what’s even more worrying perhaps is that if they keep players out for a couple of games it presents a handy excuse to the boss for any sub-standard performance. I’m not wearing it. This match was lost through seriously bad mistakes in selection and tactics before a ball was kicked or anyone took a knock. 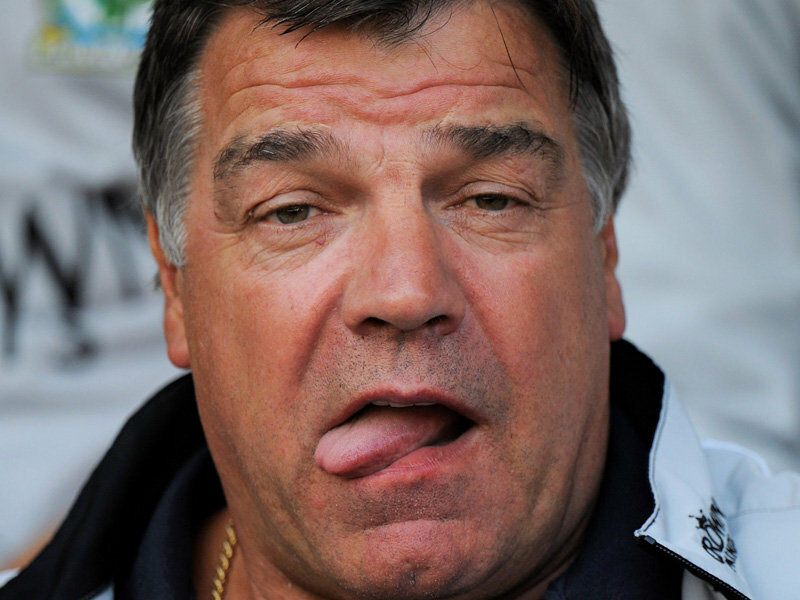 We all believed we had a real chance of winning at Anfield today for the first time in 53 years – Sam Allardyce blew it! There are different ways to lose a match; you can play well, with a fluent playing style, you can create scoring opportunities without scoring and you can lose the match. But there’s only one word to describe the defeat against Liverpool: EMBARASSING. Always long balls, never fluent passing game, embarassing players: O’Brien, Demel, Cole, Nolan are Premier League players??? Carroll, yes he run but where, it seems to be an horse… How many balls touched Nolan? Noble on the bench (now Nolan is better than him) and his substitution for who? Obviously Amalfitano, Nolan was playing very well making the difference… How many opportunities did we create? Valencia plays as a wing, he’s always alone. And please stop exalting Dowing, he’s not Hazard or Messi, he’s just a good player in the mediocrity of the others… Song was the only one deserving of dressing West Ham t-shirt. Do you think a world class player like him will stay in this team? Of course, only in BFS dreams… Go on with this formation and players and we will finish the season behind Newcastle and Everton. Looking at this match and thinking we defeated Liverpool some months ago that victory seems to be a miracle… no, it was not a miracle, there weren’t Nolan and Carroll and we played a different football. Gold & Sullivan is BFS our future? I really hope you’ll make the right decision for the fans, for our amusement and FOR THE FUTURE OF WEST HAM. I know its easy for us to complain when things aint going so well,but this is an issue that has been apparent for a few months now.We can all see whats in front of us.We all know when we have played our best football.It really aint about today,whether we had injuries,illness or players unavailable.Its about one guy whos ego is messing about with what had the potential to have been our best seen in years.Today he was banging on about Carroll now being worth 70 or 80 million in relation to the price of other strikers sold.This was just another ego trip for him,saying aint i a clever boy insisting on the Carroll transfer.The guys a jerk. £3.9million…£3.9MILLION….We pay this man! No wonder he don’t give a toss! Laughing all the way to the bank at our expense! How many times do we have to play with 10 men. Nolan ( for him didn’t have a bad game) but he can’t run box to box, can’t distribute the ball, and can’t score these days. he just stresses the system, so why blame Song. Amalfitano, Downing when Sam is stuck in the past. We need to play Poyet and younger, faster and more creative players. We have lost this season due to BFS. When will he look at the numbers and rest Nolan. Yeah, so we didn’t play very well at Liverpool?!?! Shock horror! Hardly front page news! We invariably never play well at anfield and we invariably always get humped! So why all the self righteous indignation?! While it appears ther may have been tactical mistakes it is always easier to be wise after the event. But I think it is also true to say that injuries dictated the tea sheet and that the diamond looses its effectiveness when one of the fullbacks are injured. Amilfitano deserved his starting place after last week but valencia continues to struggle. He doesn’t seem to keep close enough to carroll to be effective enough. However, not playing noble when kauyate was injured left Song not for the first time, horribly exposed and chasing shadows for most of the afternoon. You can’t legislate for injuries, it would be hard for any team to loose both centre halfs when one was already injured and your centre forward when another one is out of sorts and the other, is well “not available”. Hardly a recipe for sucess at a place where we have never had any luck in the past. I think people would be more tolerant of Sam if he wasnt so egotistical & self-loving.But he promotes himself as some sort of messiah when we are doing well & it is everyone elses fault when we are not playing so well.Lets face it,the season is hardly a disaster but what really ****es me off is to know in our squad we hqve team capable of giving any other team a run for their money.But we just never see this team together anymore.For 3 glorious months we saw what we could be,then we have this team taken from us because of BFS’s insistence on playing his pets.Ok,so Sakho got injured,i understand that,but even if he hadnt Carroll & Nolan would have been drafted back in at someone elses expense.Why mess about with something that was working.The Davids are both Irons fans,do they not sit back like the rest of us & realize that something isnt right & maybe think of bringing it up with Samuel.Surely he isnt so powerful in his position that he cant be told when he is cocking things up big style.I have never seen DG & DS as the shy & retiring type or does he just ignore what he is told to show he wont be dictated to by anyone.I know chairmen interferring isnt ideal but sometimes things have to be said when you see a season of hope vanishing down the kharsi. Sam got luck early season- Carroll and Nolan both injured forced new strikers to be played and new formation. Sakho & Valencia and the rest of the team couldn’t have done much better but he still reverts to type- Carroll and Nolan back and week week in week out the shape is ruined sticking Downing out wide to accommodate Nolan – quite why is anyone’s guess. I don’t think Sakho and Valencia have started together since. Fantastic reading from all contributors.Agree whole heartedly. I love the photo of the manager.Speaks a thousand words. I got a good belly laugh when I read that Rads.